Waiting for royals at Honeysuckle, Newcastle, NSW, 25 May 1901. From the Ralph Snowball/Norm Barney Collection, University of Newcastle, Cultual Collections. 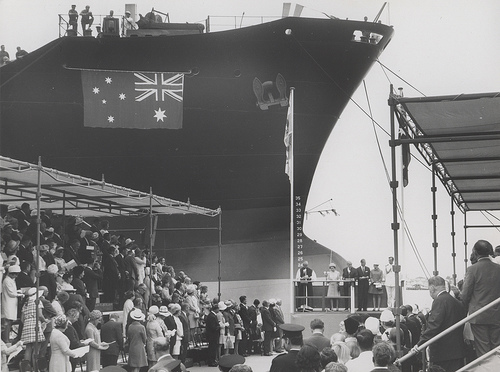 Newcastle State Dockyard, Royal Visit, 10 April, 1970. University of Newcastle, Cultural Collections. The first royal visit to the Hunter Valley was in May 1989 when the Duke of Edinburgh arrived in Morpeth by steamship met by between eight and ten thousand people. On the 25 May 1901, the Duke and Dutchess of Cornwall and York arrived to Honeysuckle Point by train to great fanfare. This was a quick stop on their way from Queensland to Sydney and they only stayed 30 minutes. 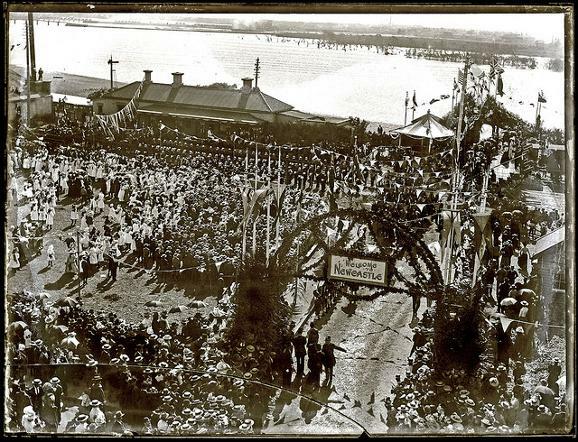 Their son Edward visited Newcastle, Maitland, and Lake Macquarie in 1920. He went on to rule as King Edward VIII. In 1927 the Duke and Dutchess of York visited. This couple later ruled as King George IV and Queen Elizabeth (also the Queen mother). The Hunter Valley saw the first visit of a reigning monarch on February 10, 1954 when the Queen and the Duke of Edinburgh visited. Queen Elizabeth II had just been crowned two years previously. In Newcastle they were met by a crowd of over 250,000. They spent only three and a half hours in Newcastle on this visit, however they returned in 1970, 1977 and 1988. Prince Charles and Princess Diana of Wales visited Newcastle and Maitland in March 1983, and also were attended by large crowds. More recently in 2012, the Duchess of Cambridge, Kate Middleton, visited Newcastle without her husband as he was attending a funeral. "THE ROYAL VISIT." The Brisbane Courier. 27 May 1901: 5. Web. 23 Jul 2013 <http://nla.gov.au/nla.news-article19087639>.